Freedom over Anxiety: 4 Simple Steps To Crush Your Fears And Love the Person You Are! Parkinson’s? You Must be Joking! Sandra Lopez's Single Chicas is a surprising story collection about single women who actually opt to stay that way. The theme is both romance and the opposite of romance. Rather than happily ever after, why not choose happy for now? In "My Brothers' Funeral," Bea laments her younger brother's choice to marry at nineteen. Instead of freaking out about being the family's old maid, Bea thinks of divorce as "the blissful release from a life sentence," and worries her brother's fiancé is "wearing his huevos like a necklace." In "Night Caller," Iris remains cool as she fields calls from a late-night stalker who repeatedly asks, "Love me." Instead of being the one who does the begging, Iris questions why anyone would do so. Her poker group provides some hilarious answers. 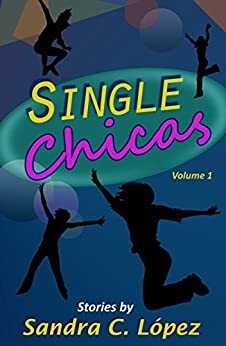 The story "Single Chicas" tells the tale of a young woman recovering from a failed relationship, and (spoiler alert) ends with a woman who is pursuing her own life goals rather than giving them up for a man. This theme is also illustrated in "Old Maid" when Danica visits a bitter vieja in a nursing home who is "holding on to some old bones" while lamenting her choice to stay with an abusive mate. In an era dominated by telenovas and selfies, plastic surgery and Kardashian role models, how often are women given the opportunity to read stories with an entirely different sort of message? Read Lopez's funny, sad stories. They're like chicken soup for the lovelorn. Single Chicas offers readers a cure for the romantic illusions that make women believe they are nothing without a man. Isn't it time for postmodern women to chuck bad relationships in favor of living an authentic, independent life? A fresh voice in Latina fiction, Lopez delivers a collection of contemporary short stories that are wonderfully varied, some pure fun, others tender and thought provoking. Five-Star faves: "Old Maid", a poignant and painful tale of a college student learning a life lesson over a game of cards with a curmudgeonly but endearing retirement home resident; "The Ball Drop", a page-turner of a mystery about a young woman who "loses" her memory but finds love; and Single Chicas, a deeply satisfying story of a young woman who seeks relationship help over the internet and learns life-changing advice about love and loss. 5.0 out of 5 starsYou'll smile. You'll laugh. You'll cry. Author Sandra Lopez has the recipe for slices of life with lots of spice. The great thing about short stories is that they are short. So in our busy world, with our frenzied schedules, we can pick up a book like this between appointments, shopping, meals, whatever, catch a story or two, come back when time permits to read another. Having said that, I will admit that I read this wonderful collection almost straight through. I found the writing so engaging, the characters so colorful, the stories such a good time, I couldn't put this short collection down. You'll smile. You'll laugh. You'll cry. Author Sandra Lopez has the recipe for slices of life with lots of spice. These stories will rock tu mundo!